John Gaffey of Garrycastle goes sky high against Rosemount in the Westmeath SFC. Photo by AC Sports Images. The prospect of an enticing senior football championship quarter final between local rivals, Athlone and Garrycastle, looms on the horizon following weekend results in the Westmeath senior football championship. 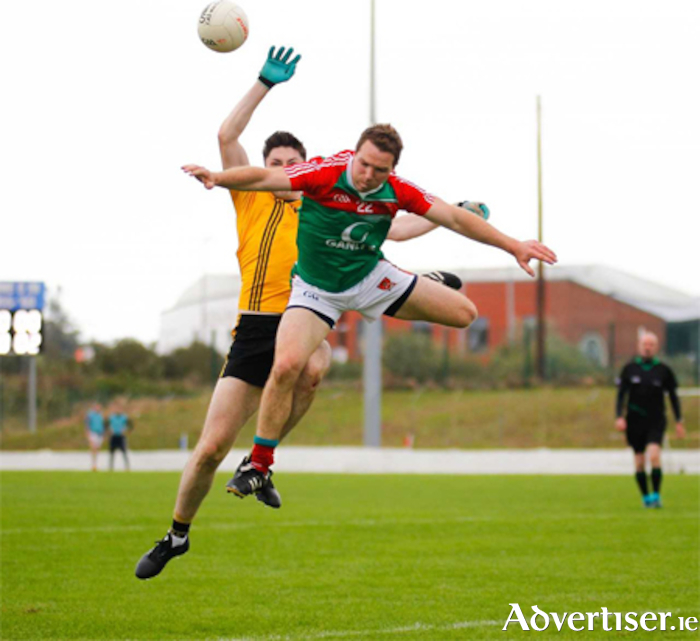 A disappointing nine point loss in TEG Cusack Park, Mullingar, for Athlone on Saturday evening as the vanquished were unable to deal with The Downs speed of movement and thought and with Luke Loughlin in sublime form, the Ray Smith managed team deserved their third victory in this year’s championship. On the back of three successive losses, Athlone need to refocus ahead of their crucial ‘winner takes all’ clash against Killucan on Saturday evening in Hogan Park, Moate (6pm ). Having started their campaign with a comprehensive win over Coralstown/Kinnegad, Flanagan Cup aspirations seem to be fading with each performance and if they are to progress to the quarter final stage, then a win must be garnered this weekend. Ray Connellan returned to the starting lineup against The Downs following his return from Australia and another week of training with the round ball should enhance his perennially positive matchday contribution on Saturday evening. A loss to Killucan would result in demotion to Group 2 ahead of the Westmeath SFC 2019, a prospect not to be harboured momentarily for the Intermediate champions of 2015. Garrycastle, meanwhile, managed to eke out a draw against Rosemount in Pairc Chiaran on Sunday evening. Beneath dank skies, over a closely fought contest, neither team could claim they merited the victory, a result which leaves the Gary Dolan/John Keane fronted team in prime position to annex top spot in Group 2. With a remaining fixture against winless Maryland to come, Garrycastle look set for a quarter final berth and should Athlone also achieve victory this weekend, the local derby knockout contest will occur. Akin to the Athlone/Killucan game, it’s a ‘winner takes all’ scenario for Rosemount this weekend. Mullingar Shamrocks provide the opposition with the victors advancing to the quarter final stages and the continuation of their championship campaign.